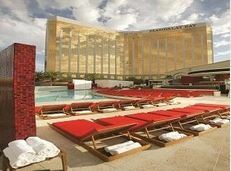 Mandalay Bay is a 4 star Hotel that seems more like a 5 star hotel, that is why we recommend it. The rooms are very modern and big, the bedding is very up to date, it is obvious this hotel remodels often. The Hotel is located on the south end of the Las Vegas Strip with no major hotels to the south of it. To the north is The Luxor Hotel, which can be reached by moving sidewalk or tram or You can take an express tram to the Excalibur to get You close to the action at the New York New York or MGM. The swimming pool at the Mandalay Bay is so nice that many locals try to sneak in. The price of the room is worth it just to get the use of the sandy beach swimming pool. Many concerts are held at the pool stage and big conventions are held throughout the year the Mandalay convention hall.